Make ‘Bath Time’ ‘Language Therapy’ Time! When life gets busy it can be hard to find time to work on your child’s early language skills BUT you can enhance your child’s communication during everyday activities that you’re already doing! Here are some tips on how to facilitate communication during bath time. Use lots of single words or two word combinations (ex. Boat! Woo. Big boat!) This will help your child identify words and repeat them. Sing songs and rhymes! These provide a lot of repetition and make it easier for your child to predict familiar words and to join in. After they know the song you can pause and give them a chance to participate. Example: row, row, row your _____. Your child may respond with an expectant look, a sound, an action, a word…all are ways of communicating with you. Song ideas: row your boat, Patty-cake, this little piggy etc. Similarly to the songs – use simple repetitive routine games to give them a chance to participate. Example: bring a toy up while saying ‘up, up, up’ and drop it into the water as you say DOWN! Once they are used to this routine pause before you say down to give them a chance to respond and join in. Expand on your child’s utterances. For example: if they say “duck” you can say “yellow duck”! Give choices – do you want the boat or the bucket? Do you want the pink towel or the yellow towel? Have fun and enjoy your time together! Bath time is a great time to bond with your child and teach them many important language and play skills! Happy bath time! The environment and daily routines in your home can be one of the best teaching tools to help children develop pre-reading skills. A print-rich environment helps foster skills needed for reading. By surrounding your children with print in your home and talking to them about what it means, they will learn more every day. They will begin to discover cues and understand that the words they see in print and the words they speak and hear are related. They will begin to learn that print can carry a meaning, and that therear many different ways to communicate. A print-rich environment also ignites an interest in writing. Kids want to model what they see around them and communicate in written form. If they also see you modeling reading and writing during your daily activities, they will want to try to communicate this way too! Post signs and label items in your home, such as “Kelly’s room” on your daughter’s door, or “coats” by the hooks by the back door. Draw your child’s attention to these signs as you read them. Make labels together. For example, when you pack away the winter clothes, have your child put labels on each container (e.g. hats, mitts, sweaters, pants). If your child is young, you can write the word for them and they can try to write it underneath. Write a grocery list together. Have your child help you decide what you need, and then write the words down. Look at the list together in the grocery store and have your child help you cross off items as you shop. 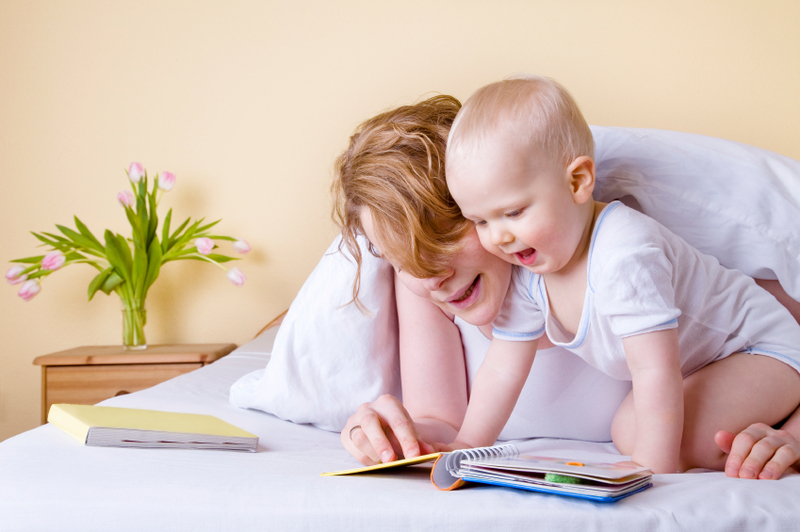 Surround your child with lots of books-storybooks, non-fiction books about things like dinosaurs and insects, as well as poetry and nursery rhymes, newspapers and magazines. Create a “reading corner” in their bedroom or in the family room. Point out print to your child during daily activities. For example, when you are cooking, direct your child’s attention to the recipe and read it aloud as you follow each step. You child will begin to learn that print carries meaning. You can also point out print when you are out of the home. For example, point to the stop sign and tell your child that every time you see those words on that sign you need to stop. Have them help you watch for stop signs. Make growth charts together. Measure your child’s height and have him help you record the numbers. Talk about how the numbers are getting bigger as they are getting taller. You can display this chart in their bedroom where they can see it. You can turn a walk into a learning activity by playing games such as pointing out all of the “S” words that you see on signs or store names, etc. You can also use a sand box for letter recognition. Writing out letters in the sand and erasing it is a great game that kids will enjoy and it’s easy to do. When kids are in an environment that has labels, signs and charts, they will be exposed to letters, words and numbers early and make connections between the letters and the functions they serve, thus developing their pre-literacy skills. Try these suggestions in your home, and have fun! Allergy season is here in full force and with it comes sneezing, watery eyes and often itching throat. Aside from these apparent symptoms, allergies can also lead to ear infections in children due to irritation in the Eustachian tube. There are very close ties associated with recurrent ear infections and delays in speech and language development. Children who have suffered from several ear infections may have mild hearing loss making it difficult for them to hear low intensity grammatical markers such as past tense /–ed/ and third person plural /-s/, and high frequency consonant sounds such as /s/. Children learn these grammatical markers, and sound production, first by imitation which is made very difficult if they are having trouble hearing these specific sounds and markers. It is very important to be aware of the status of your child’s hearing, even in the spring and summer, as it could be effecting their speech and language development. Early vocabulary – what should I be teaching my toddler? Often when parents think of what kind of words they would like their toddler to learn, these are some of the ones that come to mind: mama, dada, ball, bear, blanket, bottle, book, movie, car, home. Now take a look at what types of words all of the above are. Think way back to grade school when you learned about grammar and words classes. How would you classify them? They are all nouns – a person, place or thing. Children start saying words at around 1 year old. Nouns are great for children at this stage of language use. They can ask for the people and things that are most important to them. Verbs or action words: Actions your child may encounter often are eat, sleep, wave, read, want, and go. Now you may be wondering how do you teach your child. Try something speech-language pathologists call focused stimulation. This involves you setting up a situation where you can use a target word many times so your child gets the input on how the word is used. To focus on “eat”: Prepare and eat different pretend foods. This helps children learn lots of different names for foods and can help you focus on the word “eat” as you eat bananas, eat cake or eat sandwiches. To focus on “hungry”: Bring more people, dolls or animals into your pretend play. Mom is hungry, dad is hungry, bear is hungry, bear is still hungry. Playing is a way for children to expand their vocabulary, so be imaginative and have fun! What is a Phonological Disorder? When a youngster is learning to speak, he or she will often have difficulty producing certain sounds and will replace those sounds with another sound. A common example of this is the “Elmer Fudd” way of speaking, where all the /r/ sounds are replaced by /w/ sounds. There are several typical phonological processes that children use as they learn speech and language. Usually, children are completely unaware that they have mispronounced a word and may even argue that they said it correctly. Typically, as children get older, they learn to produce those difficult sounds and usually correct those errors without even realizing it. As this happens, children’s speech productions become clearer, and they becomes more intelligible (i.e., easy to understand). When phonological processes do not disappear by a certain age; and/or the child can easily produce the omitted sound but doesn’t use it in his or her speech, the child is said to have a phonological disorder. Phonological disorders can and do affect pre-literacy skills. As a result, children with these difficulties usually have difficulty learning to read and write. • We can work with the child and caregivers to improve pre-literacy skills. Written by: Claudia Correia, Speech-Language Pathologist, The Speech Therapy Centres of Canada. According to the March of Dime, 8% of infants born each year in Canada are premature. The World Health Organization’s definition of premature is an infant born before 37 weeks gestation. Often infants who are born premature have delays in early milestones of development including speech and language. Some of these delays may be due to medical issues related to being premature or the simple fact that they need to focus on earlier growth and development after birth that would have happened before birth with a full-term infant. Wide spread understanding is that these delays and the gap between full term and pre-term infants narrows as the child grows. Early intervention in the areas of speech and language for children who were born premature can help to narrow this developmental gap. Speech-Language pathologists can work with parents to implement strategies to increase language development, help parents to understand the stage in language development that their child may be at, what to expect and where to go from that point. As with any skill which may be delayed or difficult, early identification and intervention is key to success; and key to narrowing the developmental gap for premature infants. Written by: Stephanie Mathias, Speech-Language Pathologist, The Speech Therapy Centres of Canada Ltd.